Self-contained water bowsers are available to hire in various sizes including 500, 1100 and 2000 Litres. These Jetters and mobile Pressure Washers are available in either a Highway or a Plant version. The Highway Bowsers are designed and built to be fitted to a road vehicle. The Plant Bowsers are built to the same design but are usually connected to a plant machine and generally used for site work. 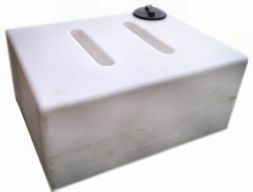 We hire a superb range of robust moulded tanks complete with baffles. These tanks range in size from 400 litres to 650 litres capacity. Baffles are internal compartments within a tank, which restrict the movement of liquid in a part full tank during transit. This movement of a liquid can prove extremely dangerous on the road holding of the vehicle.